LNS recently had the opportunity to attend and speak at the 2019 Congress on the Future of Engineering Software (COFES 2019) in San Mateo CA. Celebrating its 20th anniversary, 120 engineering/design tools experts including venture capitalists, engineering software vendors, analysts, and manufacturers attended the conference. The focus of COFES is primarily around mechanical CAD, product lifecycle management (PLM) and associated simulations systems with a growing emphasis on the expanding world of design in process, software, and electronics industries. This year’s conference had a theme of “how engineering software must adapt to support technology convergence” as product and building design teams must now deal with additive manufacturing, demands for smarter products, Industrial Internet of Things (IIoT), augmented reality/Digital reality, machine learning, and the Cloud. The engineering software space has been dominated by a small set of PLM vendors such as Dassault Systèmes, ANSYS, Autodesk, Siemens, PTC, etc. These companies have a significant presence in the mechanical design and analysis world and a relatively stable market share over the last decade. Despite the maturity of the market, the technology is quite dynamic with lots of essential innovations coming from the PLM giants and technology start-ups. End-users and design firms reported that these new tools are having a positive impact on the design process and models. Dr. Andreas Vlahinos, CTO Advanced Engineering Solutions noted the impact but cautioned that these tools are not replacements for existing simulation and design products but rather systems that are additive to simplify the work of design or simulation engineer. Ralph Verrilli, Managing Director of Madison Park Group noted that merger and acquisition teams of the large PLM “strategics” were quite active because of the innovation across the design world. He went so far as to say this market segment “…has suddenly become hot again.” Madison Park now tracks over 300 companies in the engineering space. LNS believes all this development is a great thing. Innovation within the design silo is a necessary and potentially impactful initiative. That said, LNS sees ideation within the design silo as necessary but insufficient to drive step-change improvement in New Product Introduction (NPI). We’ve been surveying industry for all seven years of our existence. We have done specific surveys on NPI in 2018 and Industrial Transformation (IX) Readiness in 2019. One of the core findings in both those surveys is that collaboration across departments is key to NPI and IX success. In terms of NPI, we found that organizational interactions were fundamental challenges within NPI. Further, we found that most corporations were not able to achieve even fundamental goal alignment across organizations. Product development and operations were goaled around quality with the quality department less likely to be goaled around quality metrics (surprising huh?). The systems in place were disparate and did not support cross-departmental collaboration. Survey data indicates that spreadsheets are the dominant form of engineering systems being used 91% of the time in requirements management and 80% of the time in risk management. Spreadsheets are, of course, inherently siloed. The NPI processes either lacked a formal definition or were not consistently applied. The cross-functional engagement was typically engaged late a notable percentage of the time. Sidenote: It should not be surprising that systems do not encourage cross-departmental collaboration. The way corporations’ budget for and procure software helps this. Budget is almost always in the functional budget (quality, engineering, finance) and the functional head drives the decisions with support from IT. In that environment, cross-functional solutions are difficult to procure. LNS has often advised vendors to be careful of trying to sell cross-functional solutions just for that reason. In this environment, it should not be surprising that in 44% of the cases, NPI failed to achieve the initiative’s objectives. 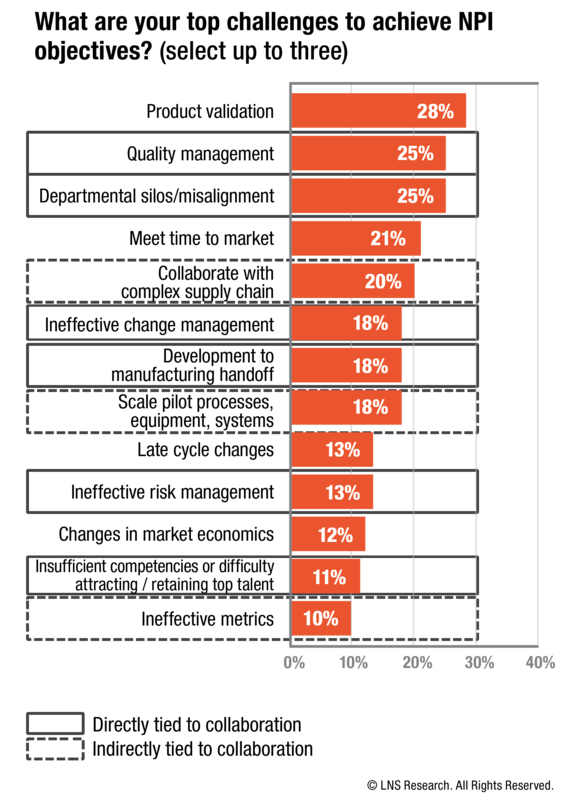 We found IX Leaders were 31% less more likely to focus on business processes and 60% less likely to focus on technology prototyping as the core organizing principle of their IX Program. LNS concluded that transformation does not come from technology but rather from process changes empowered by collaborative technologies. Moreover, we found that re-automating within a silo while improving the performance within that silo, does not have the step change impact that automating across silos to rearchitect processes provides. 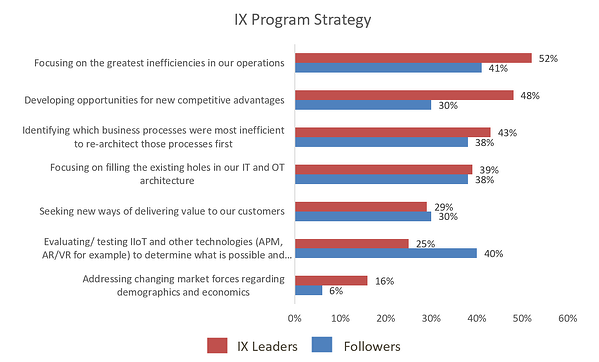 These studies into NPI and IX led LNS to advocate in our presentation at COFES for organizations (and vendors serving those industrials) to focus less exclusively on “engineering” software and rather to focus more generally on “Digital Innovation” which demands a more inclusive approach to innovation-oriented activities. In our session, we presented the LNS Digital Innovation Framework. The Digital Innovation cycle does not replace existing processes such as phase-gate, agile, or plan-do-check-act. Instead, the framework captures how to embed innovation and digital insights into existing processes. The Digital Innovation Framework blends the elements of strategic, collaborative and digitalized into a cycle that drives change and disruption to enable manufacturers to excel in today’s market. Further, we encouraged the engineering software vendors to think bigger: think innovation across silos. Very specifically, we view IIoT Platform suppliers to develop PLM collaboration applications “extending and enhancing” existing applications to embrace the collaboration challenge inherent in Digital Innovation. We also encouraged software vendors developing and deploying Digital Twin solutions to think beyond the focus on asset performance management to more fully embrace the collaborative potential possible with a robust Digital Twin. Digital Twin could become the “single version of the truth” for products, assets and operations. Both technologies offer significant capabilities to enhance and empower the Digital Innovation Cycle. The charter of COFES is different than many other events. It is not a trade show or a typical conference. Rather it is an event focused on building a community of experts ideally helping set the direction for the engineering and analysis world. The 2018 Congress was successful at fostering that community spirit. LNS will be watching future events to see if they can build on this year’s, and their 20 year, momentum.